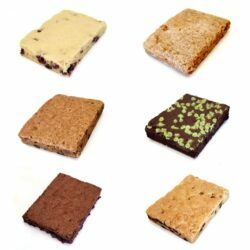 Bella’s Gluten Free Brownies and Cookie Bars are made with all the same love and attention, but with NO GLUTEN! 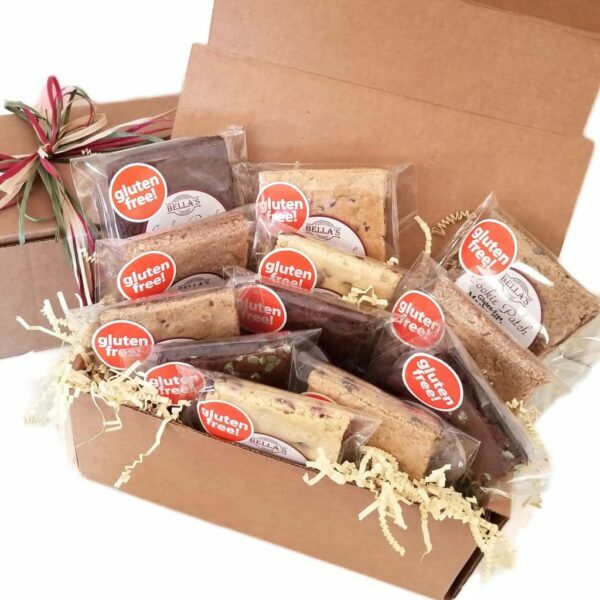 We mix all natural, high quality ingredients with our special non-gluten flour blend to create five varieties of Gluten Free brownies and cookie bars that truly satisfy! 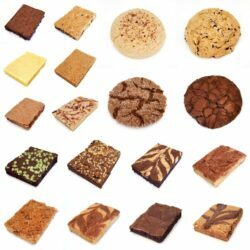 Choose your favorite assortment of six (6), or twelve (12) individually wrapped, moist and flavorful varieties. Allergy Information: Our Gluten Free products are made in a non-dedicated Gluten Free bakery, using gluten free ingredients. 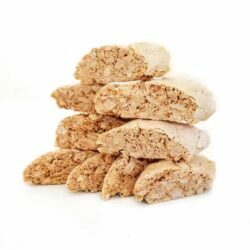 They are produced in a facility that uses wheat flour, soy, peanut butter and tree nuts and may contain trace amounts of these ingredients. Please enter the number of each variety that you would like to receive. Ingredients: Brown Sugar, Gluten Free Flour(Brown Rice Flour, Potato Flour, Tapicoa Starch, Xanthan Gum) Eggs Semi-Sweet Chocolate Chips (Sugar, Chocolate Liquor, Cocoa Butter, Soy Lecithin, Vanilla), Salted Butter, Vanilla Oil, Baking Powder, Salt. Serving Size: 1 oz , Calories 111, Fat Calories 50, Total Fat 6g, Sat. Fat 3g, Trans Fat 0g, Cholest. 30mg, Sodium 72mg, Total Carb 14g , Dietary Fiber 1g, Sugar 9g, Protein 1g, Ingredients: Sugar, Gluten Free Flour(Brown Rice Flour, Potato Flour, Tapicoa Starch, Xanthan Gum) Eggs, Semi-Sweet Chocolate Chips (Sugar, Chocolate Liquor, Cocoa Butter, Soy Lecithin, Vanilla), Salted Butter, Cocoa Powder, Vanilla Oil, Baking Powder, Salt. Ingredients: Brown Sugar, Gluten Free Flour(Brown Rice Flour, Potato Flour, Tapicoa Starch, Xanthan Gum) Eggs, Semi-Sweet Chocolate Chips (Sugar, Chocolate Liquor, Cocoa Butter, Soy Lecithin, Vanilla), Salted Butter, Coffee, Vanilla Oil, Baking Powder, Sea Salt. Ingredients: Brown Sugar, Gluten Free Flour(Brown Rice Flour, Potato Flour, Tapicoa Starch, Xanthan Gum) Eggs, , Salted Butter, Cinnamon, Vanilla Oil, Baking Powder, Salt. Ingredients: Sugar, Gluten Free Flour(Brown Rice Flour, Potato Flour, Tapicoa Starch, Xanthan Gum) Eggs, Dried Cranberries (Cranberries, Sugar, Sunflower Oil), Salted Butter, Vanilla Oil, Baking Powder, Salt. Ingredients: Brown Sugar, Gluten Free Flour(Brown Rice Flour, Potato Flour, Tapicoa Starch, Xanthan Gum) Semi-Sweet Chocolate Chips, Salted Butter, Eggs, Vanilla Oil, Baking Powder, Baking Soda, Salt. I ordered the Gluten Free Blackout Brownies and they are amazing. Soft, fudgy, moist and absolutely delicious. They are the best brownies that I have ever had and have become my new favorite. You can’t tell the difference between a regular brownies vs the Gluten Free. Bella’s has perfected the Gluten Free brownie and my friends and family love them.